Winter is a slow time for caterpillar news in the Northeast. Most lepidopterans overwinter as eggs or pupae, and any overwintering caterpillars are usually hiding in the leaf litter. As a child I never liked winter very much, because there are very few insects to find. What’s the point in going outside if you can’t catch bugs? However I still get some caterpillar identification questions from around the world. If you have a question of your own, send along a photo, I enjoy a challenge! This caterpillar hails from South Africa, a country I would love to visit someday (and some of my Acronicta caterpillars can be found there!). It appears to be Hippotion celerio, in the family Sphingidae, the hawk moths. Sphingid caterpillars are large and often have a “tail” at the end of their bodies. If you live in the US you are probably familiar with the tomato and tobacco hornworms, genus Manduca – they are fat green caterpillars, and big garden pests. I found this video of Hippotion celerio in action. It’s pretty cool how the body can stretch out, and then retract to look more like a snake-mimic. If you want to learn more about caterpillar eyespots, check out Tom Hossie’s blog about his research! 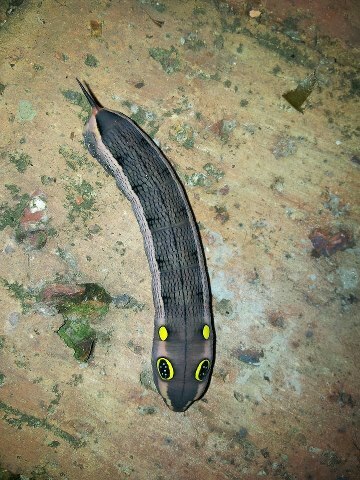 Posted on March 12, 2013, in Invertebrates, Lepidoptera, Sphingidae and tagged caterpillar, caterpillar identification, eyespots, hawk moth, hornworm, South Africa. Bookmark the permalink. 2 Comments. How does a habit/hobby turn into a PhD? Ask Brigette! info. Thanks for the post. I’ll crtainly return.